In 1895, the people of Louisville buried a time capsule with some rare Confederate artifacts. It included everything from a cigar smoked by the Confederate President Jefferson Davis to some Confederate currency. This week, the capsule was opened to reveal that it’s now just a bunch of soggy garbage. How fitting. 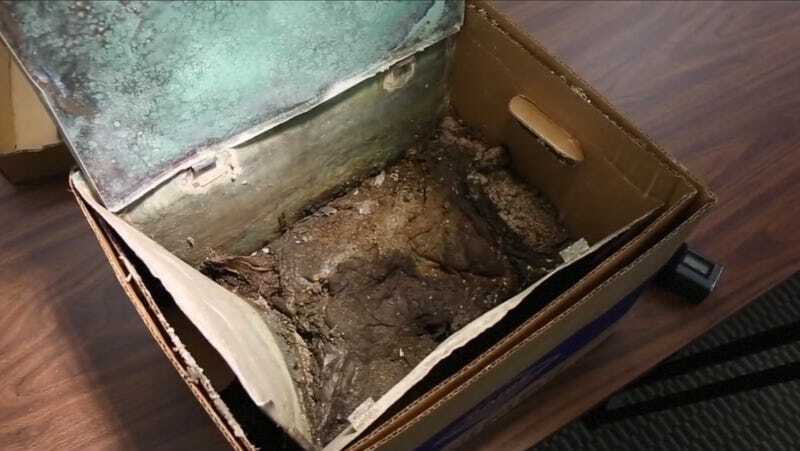 The time capsule has been the center of controversy for some time, as it was resting underneath a hotly debated 70-foot tall Confederate monument near the University of Louisville. When it was announced that the monument would be removed, several pro-Confederate groups sued to stop it. But a judge ultimately ruled that the monument belonged to the city and that Louisville public officials could do whatever they wanted with it. The monument was installed in 1895, a full 30 years after the end of the Civil War, as a testament to the greatness of the Confederacy—a treasonous movement to retain slavery in the Southern states and one that decent Americans now see as a moment of shame in our history. The monument is now being moved to a neighboring county site where it will sit amongst other relics of the Civil War, rather than prominently displayed in the middle of town. As for the time capsule, historians are doing their best to piece through the remains of what they believe were photos, books, and a Bible, along with that cigar and currency. Anything that historians are able to salvage will be donated to the Filson Historical Society. But judging from the photos of the capsule alone, it’s doubtful there will be anything worth saving. The dumbass Confederates who were romanticizing their garbage history didn’t do a very good job preserving it for future generations. Again, it seems quite fitting that a lost cause like the Confederacy would lose some of its artifacts to history. It’s important to remember our past so that we’re prepared to fight the forces of tyranny and oppression that inevitably rear their heads in the future. But I dare say this country has enough Confederate history sitting right in public view.